It was a week mostly like this. I got stacks in good but ended up losing. Eighteen sessions. Two hundred eighteen minutes. 943 hands. -325BB. -34.5BB/100 hands. MIssed the Thursday night $9K because of a family obligation and I had to work on Saturday, so the special $25K game was out. I ended up getting in at break in the Friday night game after passing up the opportunity to smoke legal weed at a friend’s get–together early in the evening. Got the buy-in and add-on, but not the live re-buy. I’m cheap. My table was entirely late-reggers, including several of the club’s top regulars. On the second hand I played, about 40 minutes after the first break, I had K♥T♥ in a multiway raised pot, the flop was K♣T♣8♠, and a regular on my immediate right made a bet. I shoved, everyone else folded, and the reg called with A♣8♣. The two pair held and he doubled me up, though it didn’t make much of a dent to his stack, even though we’d started at the same time. Half an hour later at the second break, I had 40K, equal to what you could buy in for if you bought the max chips. Chip average was 51.5K, so I felt relatively comfortable. By that point, my original table had broken and I was in a new position. On the first hand after the second break, we had a raise and four callers (not including me) to the flop, a bunch of low diamonds on the board. Everyone checked, The turn made it 3♦4♦5♦6♦. Nervous chuckles all around, but no bet. 7♦ on the river and everyone checks, not a diamond in the bunch. Not that it mattered at that point. Five way chip. 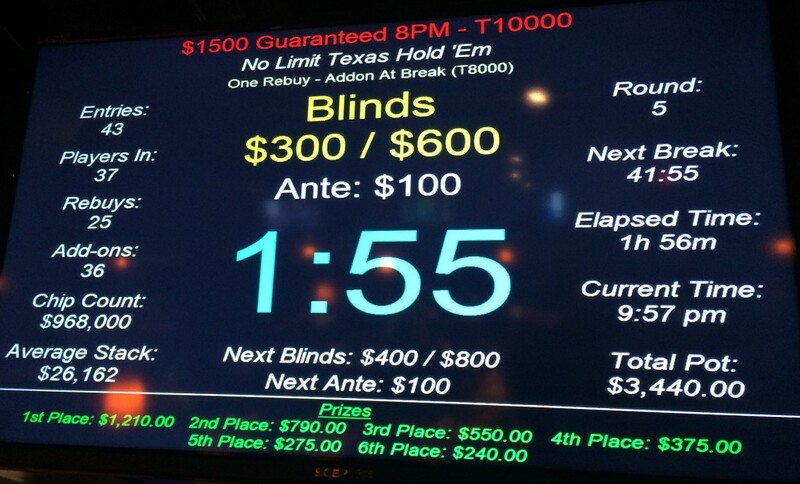 I picked up blinds and antes in one hand with a shove holding KxQx. A little bit later, I open-shoved the same combo from SB and was called by BB, who showed down the same hand. Lost a little more than a third of my stack when I called a raise with it, then a third player re-raised, the original raiser called, and I called, only to have the original raiser shove a Jx7x4x flop, which he took down. Two-and-a-half hours in I hadn’t seen a pair above 6x6x. Finally got QxQx and shoved 12BB and got no callers. I spent most of three hours with a third to a quarter of the average stack. I’d just been through the blinds when our table broke and I was moved into the BB on the new table. A fold left me with only about 3BB (and I still had to pay SB on the next hand. Shoved over a raise with Ax8x and got called by queens, with low bards on the board and that was the end of the chance to make the WSOPC Main Event at the Bike! Three hours and forty minutes. 27th of 104 entries. I really blew this one. Got into the game with a ticket from points for all of the Zone play. Fifteen minutes in, I got incredibly lucky, and not because of the cards. I was in BB with T♦A♥. UTG and SB limped, I raised from 40 to 160 (stacks were still mostly in the range of the the 5K starting stack). Both players called. The flop was A♦7♣K♦, I bet 250, UTG called, BB folded. UTG had Q♥J♠, so he’s pulling for a ten. The turn is 4♦, I bet 500 and call a raise to 1K. 9♥ on the turn, I check, UTG tries to rep the flush again, and I go all-in to call. I was down about 500, so I come out with 9K. I take out a short-stacked player half and hour later, drop back down near starting stack after losing a couple hands then getting bluffed off 6♦6♣ on a 5♦7♥9♦5♠ board by A♦4♦. Then I tripled up with J♥J♣ against A♣2♣ and J♠A♥ on 3♣4♣8♦J♦8♠. That put me up to 14K. Just a couple hands later, I knocked out a similarly-sized stack with K♦K♥, outrunning a flopped flush draw by J♠Q♠. Suddenly, I was in the chip lead. 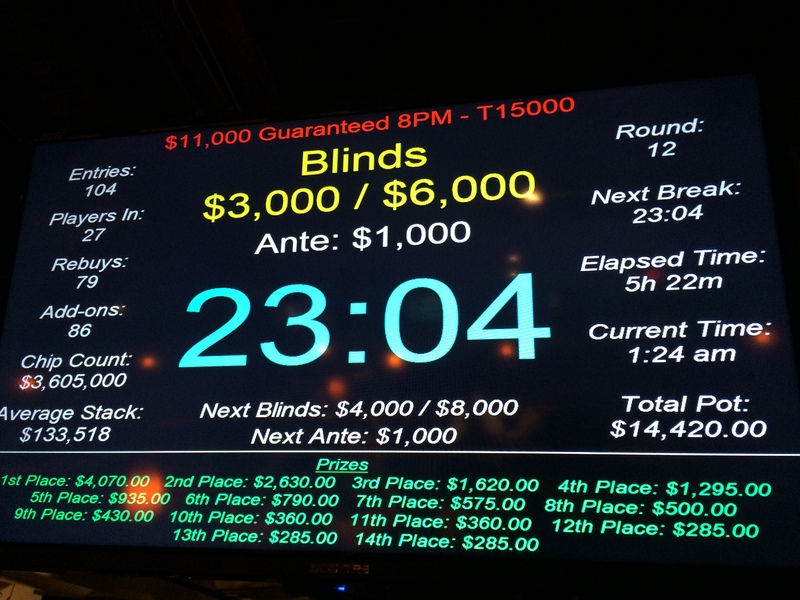 Picked up another 5K from a guy who 3-barreled me when I had 2nd pair, which put me over 30K. Then it was downhill. Flopped top pair against bottom set (who made quads on the river) but didn’t pay off the river value bet. I did, however, pay off with 7♦7♣ when K♦Q♦ went all-in after making a river flush. That hand took me from 22.3K to 8.3K, and left me with just over 16BB, which wasn’t enough to keep me alive long enough to make the money. Three hours and five minutes. 210 hands. 26th of 142 entries. Lost 3/5 of my stack the first hands I played. J♣9♣ made an open-ended straight draw on the flop. A short stack goes all-in, UTG shoves, and I shove. 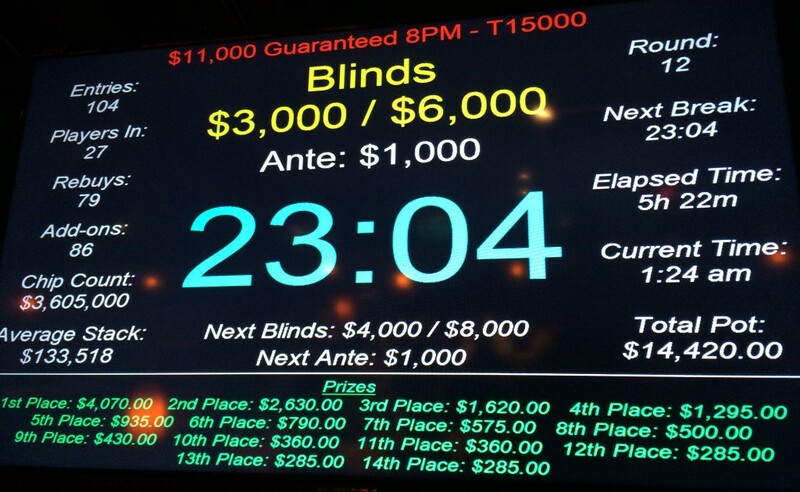 UTG has 9♦J♦, short stack has J♥Q♣, and short stack wins with queen-high. Out just a fe3w hands later all-in pre-flop with Q♥T♥. Fourteen minutes. 13 hands. 37th of 43 entries. The start of a bad day of live poker. Already trying to forget it. Did an (uncommon for me) rebuy because there was some overlay (the early starts this month in Final Table’s shootouts may be eating into their morning tournament). Half the field went to the final table. I was short-stacked, lost a race with tens to another short stack and missed the money by a few spots. Two hours and forty minutes. 7th of 21 entries. Came back in the evening and the overlay was even bigger. Again, I had to do a re-entry, but things did not go my way and I busted on the last hand before break. Fifty minutes. 14th of 15 entries. The early bustout from Final Table meant I could get over to Encore in the middle of the second level. Bought the live re-buy when I got in, There was not only no overlay there, the pot was more than double the guarantee. I made what was probably a bad bet and had to fold to an all-in and just never managed to recover. Sixty-five minutes. 37th of 43 entries. Late reg with a ticket. It’s a Deepstack tournament with 10K chips to start. 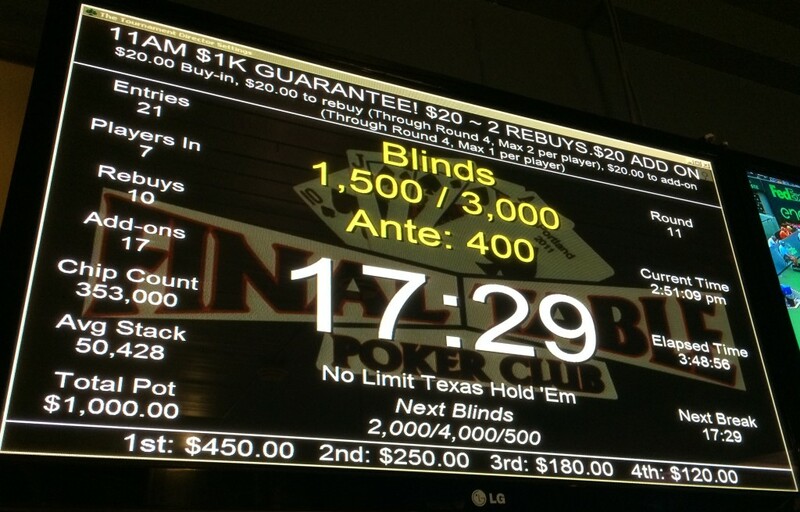 I sign up during a break during Level 11, with blinds at 250/500/50. My first hand, I have AxKx UTG2, and I raise to 1.5K. CO shoves for 7.6K, I call when action gets back to me, and the board runs out with a ten on the turn. Next hand, I shove 7x9x and triple up against the table chip leaders with high ace hands. Then it’s out a couple hands later shoving QxTx. Five minutes. 4 hands. 397th of 717 entries. 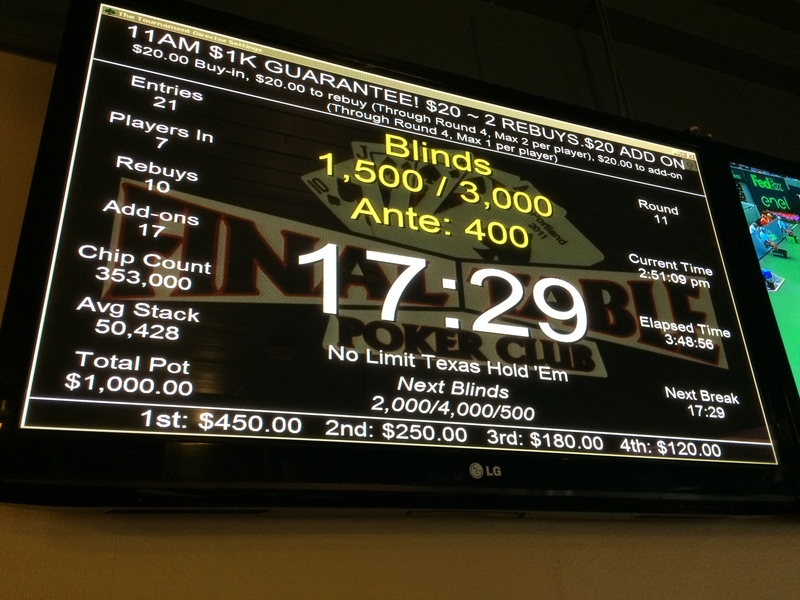 This entry was posted in General Poker, Live Games, No Limit Hold'em, Ring Games, Tournaments by Poker Mutant. Bookmark the permalink.